After careful consideration, you’ve finally chosen the perfect piece of new furniture for your home. But before you place that order one more step will help ensure years of enjoyment: measuring your furniture and home to ensure that the furniture piece will fit through doors, hallways, staircases and porticos to make it into your home and rest happily in the spot you intend. Be sure to consider all doors, entryways, stairs, and hallways from delivery truck to the final destination of your new piece of furniture. Look for obstacles like chandeliers and other fixtures, bannisters and turns. 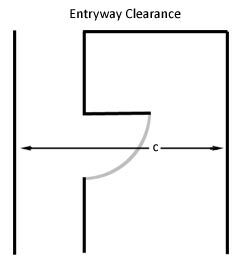 Pay special attention to narrow entryways and hallways, to determine entryway clearance, measure the distance from exterior/hallway wall to the opposite wall on the interior – your furniture cannot be longer than the length (c). 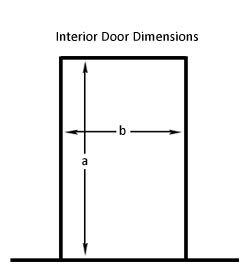 Measure the interior height (a) and width (b) of all doorways that you will pass through to get your furniture in its place. Be sure to take a good look at how far doors open, unless the door can swing open a full 180 degrees, it will partially block the opening of the doorway and reduce your clearance dimensions. Check staircase width, remember to subtract out room taken up by the railings and banisters. Check stairway height clearances for overhang or ceiling height, measuring at the points with lowest clearance. If your staircase curves, check clearances around the corner and depth of opposite wall. If you live in a building with elevators, check doorways depth and height of the elevator and clearance in hallways and entryways. All of these factors can effect whether your furniture will fit through your space to their new home. Bring your tape measure furniture at the store or check dimensions listed on the website or brochures (and verify with sales associate/customer service). For sofas and chairs measure the height (h) of tallest part of the frame, you don’t need to include pillows or squishable cushions. Remember, often feet are removable so check on that detail as it could provide you with a few extra inches of clearance. Measure the width (w) at its widest point, typically the arms. Measure the depth (d) from the front most point to the back most point. On very tight entryways sometimes sofas fit through best at an angle. 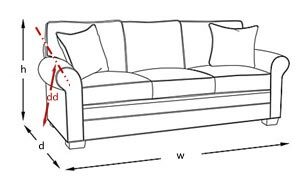 Measure the diagonal depth (dd) by using a straight edge to create a line between the highest point on the back of the sofa frame and the arm. The diagonal depth will be the shortest distance from the bottom back corner of the sofa to this line. Sectional sofas are delivered in pieces, chances are this will make it easier to fit through doors and hallways. However, some sectional pieces are very large and each should be measured individually to make sure they will all fit into your home. 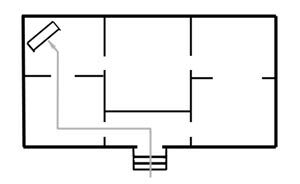 To fit: Sofa width (w) must be lower than either the doorway height (a) or the entryway clearance (c). And depth (d), width (w) or diagonal depth (dd) must be less than door width (b). Measure the depth (d) and the diagonal height (dh) of the furniture piece at its widest points. To fit: Dresser diagonal height (dh) must be less than entryway clearance (c) or doorway height (a). 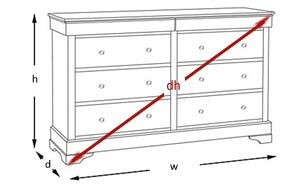 And dresser depth (d) must be smaller than doorway width (b). While you’ve got your tape measure out, here’s a special note about media cabinets. Don’t just assume that a media cabinet will fit all of your components. Measure everything that you plan to put on or in your cabinet, including TV height and width, cable box, DVR, blue ray player, stereo components, game consoles, and so on. Also, pay particular attention to how your remote controls work, some need line of sight meaning that the components need to be visible either uncovered or behind glass, others still work if your components are hidden behind doors or screens. Make sure that there is enough room in the open shelving of the media center for all components that need line of sight.